One-of-a-kind Festival Bum Bag, Boho Fanny pack, waist bag, money belt by Dazzling Gypsy Queen. 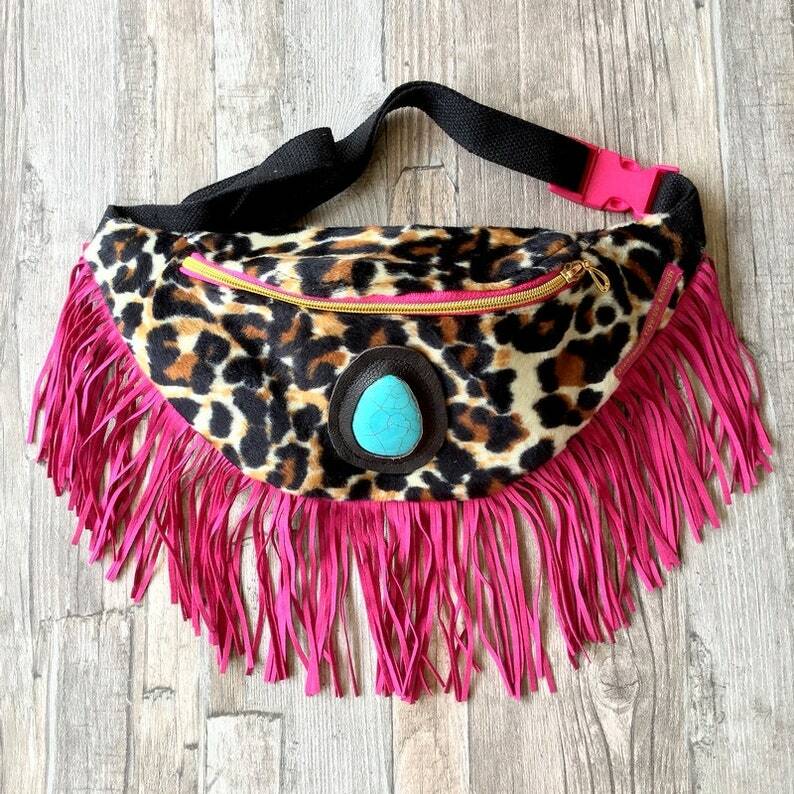 This Fanny pack is handmade from soft furry fabric with Leopard print and embellished with a Turquoise stone in Black leather with Suedine fringes. The size of the bag is approximately: 36 cm long, 14 cm heigh and the width is 8 cm. Hip belt is adjustable from about to about 112 cm. Festival Bum Bag, Boho Fanny pack, waist bag, money belt by Dazzling Gypsy Queen. For ease and safety for both buyer and seller I accept payments through PayPal only. If you want to use a credit card but don't have a PayPal account they have an option to pay without creating an account. PayPal is easy and save to use and all instruction for payment you will find during te payment process. But if you are having any problems with PayPal, please do not hesitate to contact me and I will assist you anyway I can. Please make your payment within 2 days. I will reserve the article for 2 days for you. If there will be a delay please contact me. Items will be shipped within 3 days after the payment is cleared. We inform you with all the details when the item is shipped. I tried to describe and picture my work as accurately as possible. If you have any questions about an article please contact me and I'm willing to provide you with all the information and your questions help me improve my customer service. I want you to be happy with your shopping experience. I will give a refund as long as you return it to me in five working days from the day of receipt. The item must be in original condition and well packed. The buyer is responsible for shipping and the cost for shipping the item back. Refund will be for the item sale price less shipping and handling. A refund will be made after receiving the item back in perfect state, within 3 business days. I refund through Paypal. As I have to repost your returned item in my Etsy store, there's a 10% restocking fee to cover reposting and reselling fees. All my creations go through several quality controls before they are carefully packaged and sent to you. If for any reason you are not satisfied with the item you bought and you would like to return it back for refund please contact me for our postal address where to send it back. Please be sure to wait for instructions to send the item back. I only accept returns if you contact me upfront, if the article is not used and in same condition you received it. Custom made items cannot be returned. If there is a defect in materials or workmanship, it will be repaired within one month of purchase. Please first contact me for more information. Avoid contact with perfumes, oils, creams etc. Avoid prolonged contact with water (swimming, showering etc). Gently wipe with a soft cloth to maintain good condition. All shipments are shipped WITHOUT Track & Trace. If you want a Track & Trace shipment, you need to ask for this, since the shipping costs will be higher. I recommend a registered delivery for the higher priced products. Sorry, I cannot be held responsible for packages the mailman has lost or a neighbor has misplaced! If you'd like shipping insurance, please let me know. Although I live in Singapore, most of the items are shipped from the Netherlands and can be shipped to worldwide destinations. But my new creations are shipped from Singapore. In every it is stated where the item is shipped from. Please check the information. Don't hesitate to ask for any information. Orders are shipped to your address stated on your Etsy account. Please make sure all address detail are correct, to avoid any problems with shipping. With registered mail (with proof of shipment) you have to sign for the shipment. Albanië, Andorra, België, Bosnië-Herzegovina, Bulgarije, Canarische Eilanden, Cyprus, Denemarken, Duitsland, Estland, Faeröer Eilanden, Finland, Frankrijk (inclusief Corsica en Monaco), Gibraltar, Griekenland, Groenland, Hongarije, Ierland, IJsland, Italië, Kanaaleilanden, Kroatië, Letland, Liechtenstein, Litouwen, Luxemburg, Macedonië, Malta, Moldavië, Montenegro, Nederland, Noorwegen, Oekraïne, Oostenrijk, Polen, Portugal (inclusief Azoren en Madeira), Roemenië, Rusland (inclusief Aziatisch deel), San Marino, Servië, Slovenië, Slowakije, Spanje (inclusief Balearen, exclusief Canarische eilanden), Tsjechië, Turkije (inclusief Aziatisch deel), Vaticaanstad, Verenigd Koninkrijk, Wit-Rusland, Zweden, Zwitserland. All items are shipped within 3 working days of your payment clearing. Shipping within the Netherlands normally takes 2-3 working days. Shipped to Europe normally take 5-8 working days. Shipped to USA 3-6 working days. Shipped to the rest of the world takes approximately 1-2 weeks, although customs can occasionally delay packages further. !! Please check the website of www.post.nl (Dutch) if you need more detailed information about deliverytimes, because for every country it could be different. Via Track & Trace (https://mijnpakket.postnl.nl/) you can follow your shipment very easy trough internet. Slovakia, Estland, Iceland, Sweden, Finland, japan, Switserland, France, Luxembourg. I cannot be held responsible for packages the mailman has lost or a neighbor has misplaced! If you'd like shipping insurance, please let me know. You are responsible for all taxes and customs in your country.